Did You Know: When it Comes to Expanding, The Big Bang’s Got Nothing On Us! Do you suffer from too much information and not enough knowledge? Our “Analytics”section (in the Reports/Data tab) might be just the cure! Along with a plethora of specific reports and data about activity at your property, we’re excited to announce two brand new graphs all about Amenity Reservations. 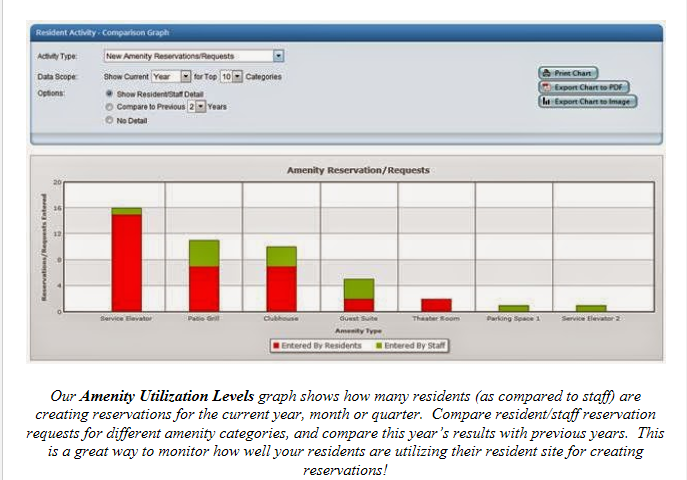 So if you’ve got questions like “Which amenities are most popular with my residents?” “How does amenity utilization this year compare to last year?” or “Do my residents place reservation requests from their own computers or do they prefer to call the front desk?” we’ve got your answers for you. Find those answers (and more!) 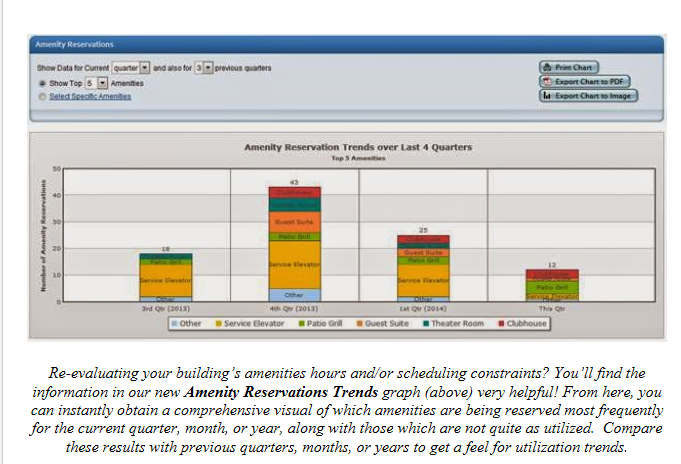 on our new Amenity Utilization Levels graph (in the Resident Activity section) and our Amenity Reservations Trends graph. Site Activity Report: A handy, at-your-fingertips list of helpful building factoids you might not have known you could access, such as how many of your residents have logged on to the resident site, which occupant profiles still need photos, or how many Bulletin Board notices were posted in the last 90 days. Employee Activity (Front Desk and Maintenance): A comparison graph of employee activity regarding maintenance requests and Event Log entries. Stats are comparable by employee assignments, maintenance categories, work order status, and time frame. Guest Activity by Unit: A quick and simple way to view guest activity by unit as well as what types of visitors each unit receives in any given time frame. Our Analytics module is always evolving, so keep an eye out for even more new graphs in the future! And remember, all of the graphs in our Reports/Data module can always be exported to Excel or PDF – so analyze away! New Resident "Convenient Payments" Module: Dream it ... and Make it Happen! What would you do if you had an easy way to collect various convenience payments from your residents? It works the way you need it to – seamlessly. Through our partner, Stripe, you can set up your own credit card merchant account that links directly to your existing bank account – all within five minutes. Now you’re ready to accept resident payments in whatever way you’d like: allow them to pay charges online, or have a staff member swipe their card. Customizable options for taxes, convenience fees, and special instruction fields ensure that you’re charging your residents exactly what they owe and not a penny more – or less. Dollars have never made more sense! Want to give it a shot? Take a look at our Payments help page, or contact BuildingLink Support to get started.